Each guest room has its own distinct character: original art, antique hand-crafted furniture, old trunks, retablos, hand-woven baskets, specially woven rugs, handcrafted southwest quilts by local artists and great-to-snuggle-under down comforters and bed coverings. 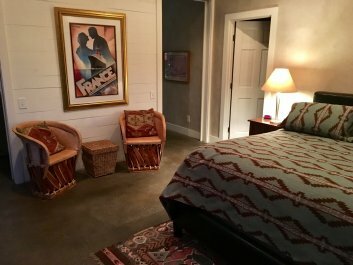 Scroll down to view all 12 of our unique guest rooms. If you would like to reserve a room click on the Check Availability button above to choose your dates and book your room and/or package. If you would like to reserve by phone or have additional questions, please call 575.758.0287 between 9am-8pm MST. Luxury bed linens by Comphy Co.
Be sure to read through our policies. 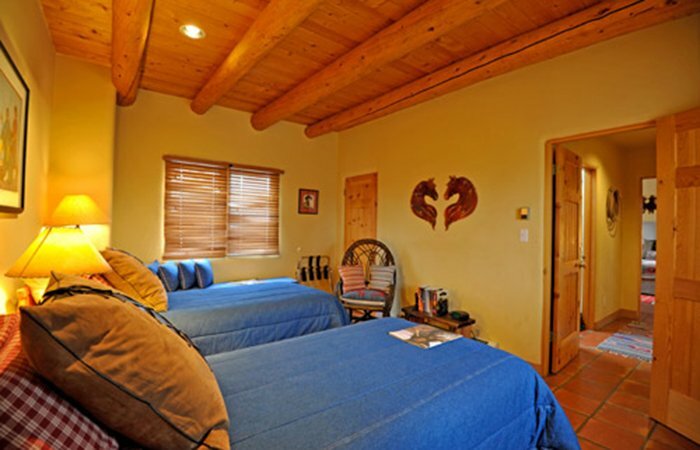 Our one bedroom, fully-contained suite offers everything you need to make yourself at home while in Taos. 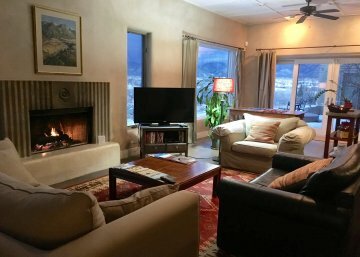 The unit comes equipped with a roomy kitchen with full-sized appliances, spacious living and dining rooms, flat screen cable television, WiFi, wood-burning Kiva fireplace, private fenced garden, and large bathroom with jacuzzi tub and stall shower. Your bedroom has a king mattress and full size futon bed that is suited for a child. 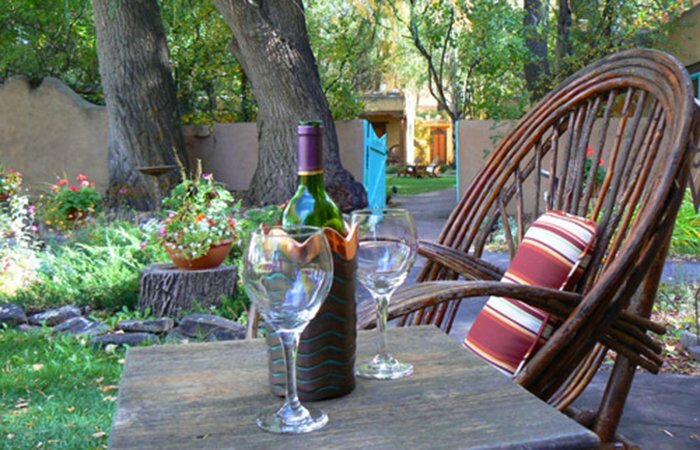 The SW Villa can comfortably accommodate four guests. Plus! Breakfast is included! Perfect for longer stays. 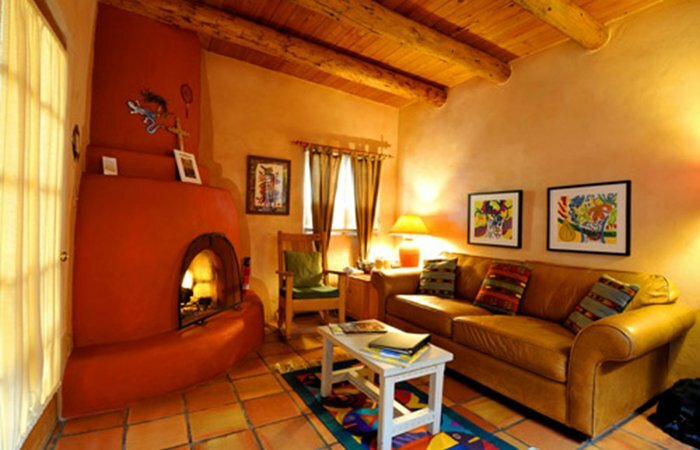 "Taos Charm" at its best. 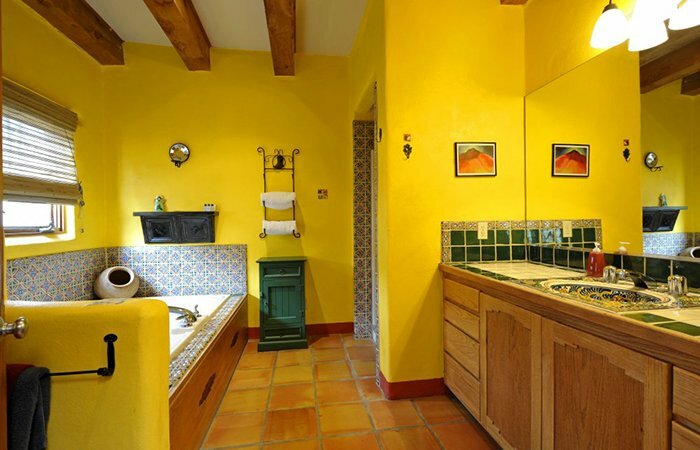 This room was recently refurbished and has a fabulous wood-burning fireplace, tile floor, viga and latilla ceiling, large dressing room and its own beautifully tiled private steam room -- very romantic! King size bed. Mini fridge. 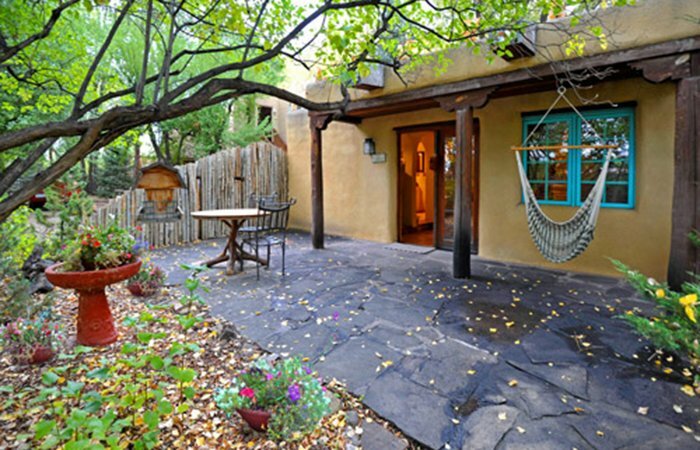 The private patio boasts a swing hammock and handcrafted outdoor furniture. A second-floor room with unbelievable views of Taos Mountain, reflections of Taos sunrise and sunsets. 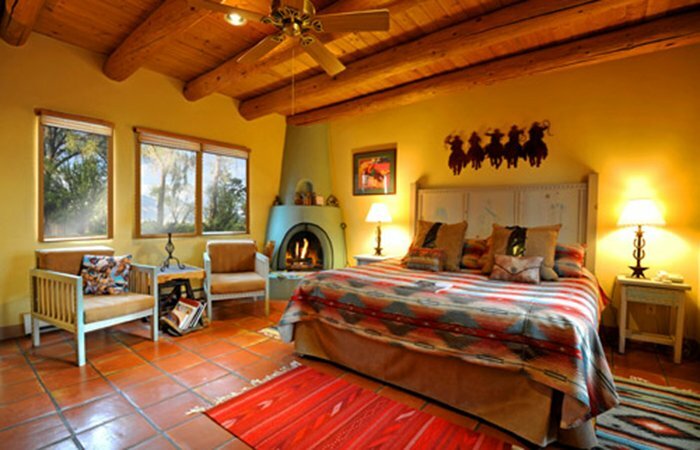 This spacious room has handcrafted furniture accented with western cowboy touches. 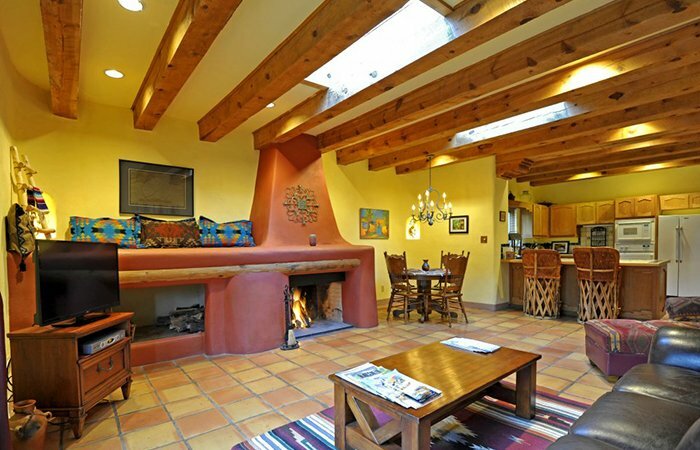 Enjoy the gas-log kiva fireplace and relax in a 4' x 4' Mexican-tiled shower/steam room. King-size bed. Mini-fridge. 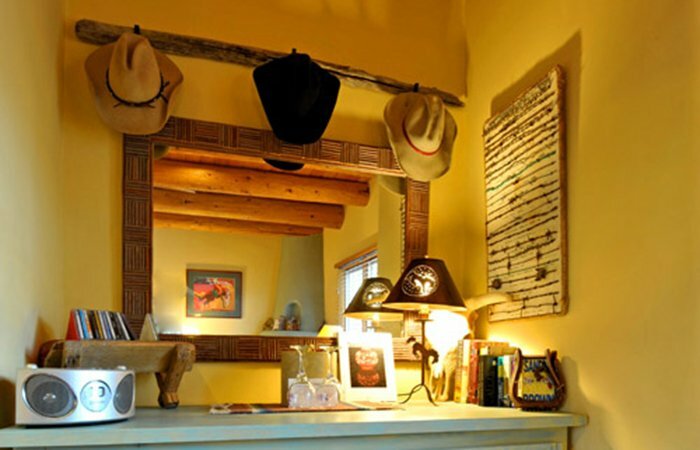 The Cowgirl room is a second floor room that overlooks the gardens and frames a spectacular view of Taos Mountain in its large picture window. 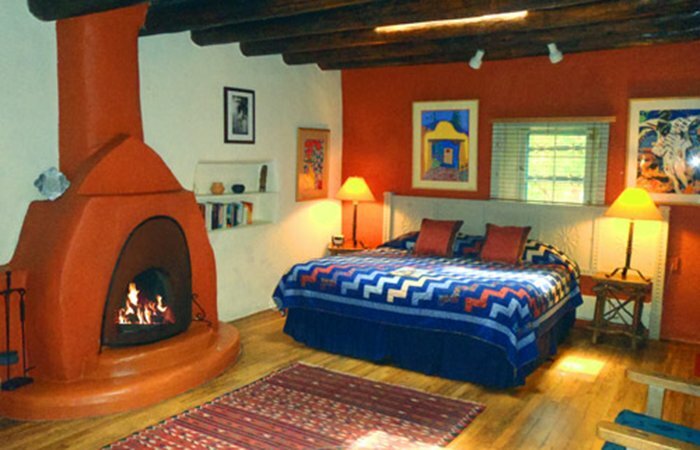 Snuggle in the king size Hacienda bed and enjoy the view or relax in comfortable Taos chairs by the corner gas log fireplace. 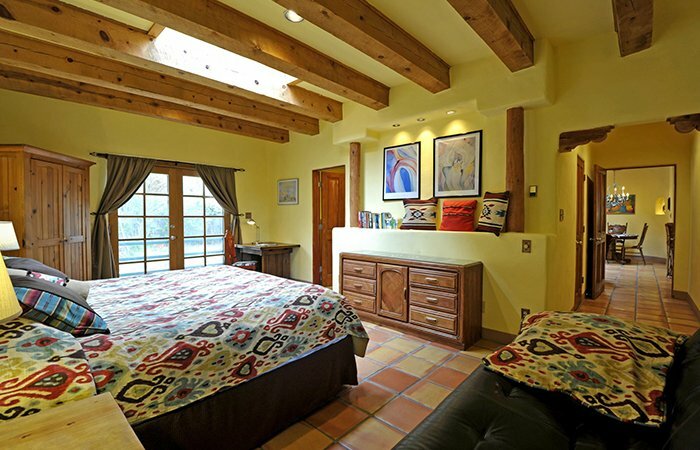 High ceilings, western log vigas, and skylights add to the ambiance of this light and spacious room. The bathroom is luxury at its best! 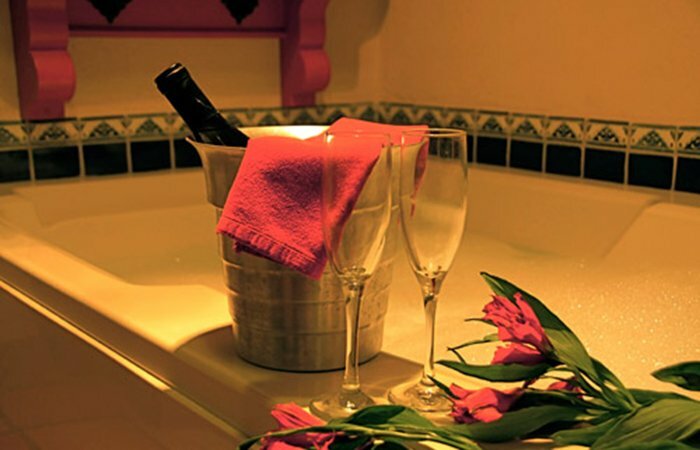 Pamper yourself in the two person 6'x4' Jacuzzi tub or the 4'x5' Mexican-tiled shower/steam room. Mini-fridge. A combination of the Cowboy or Cowgirl Room and an adjoining room. Ideal for families. 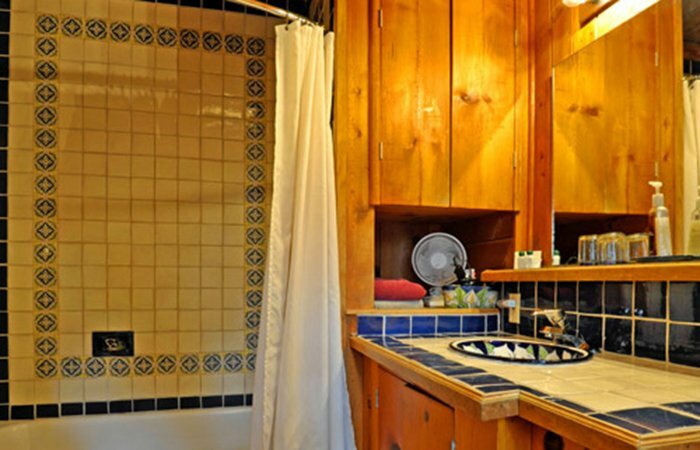 Enjoy the same views as the Cowboy or Cowgirl Room. 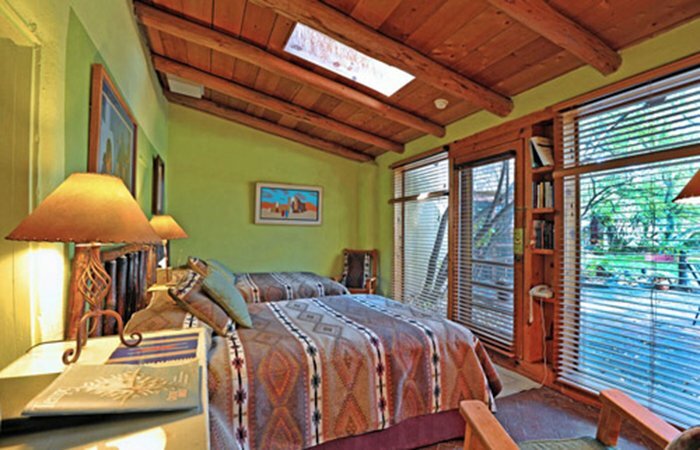 The room can be fitted with a King-sized bed, or make into two twins. 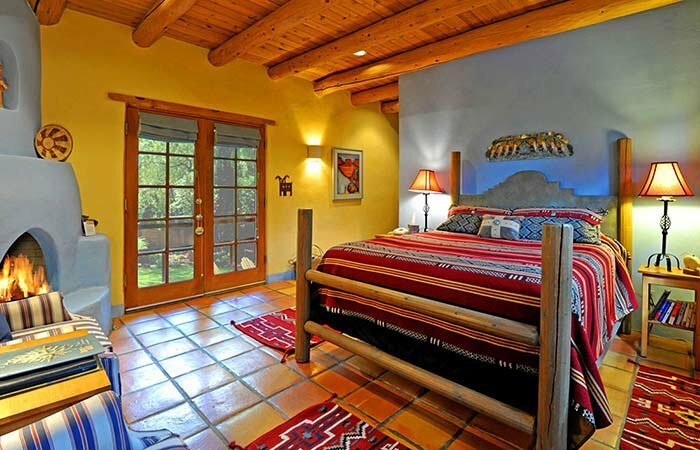 Located in the same casita as La Vista and with the same extraordinary view from French doors, this charming room with a Queen-sized sleigh bed and corner candle-lit fireplace is decorated in Native American decor. Tub-shower combo. 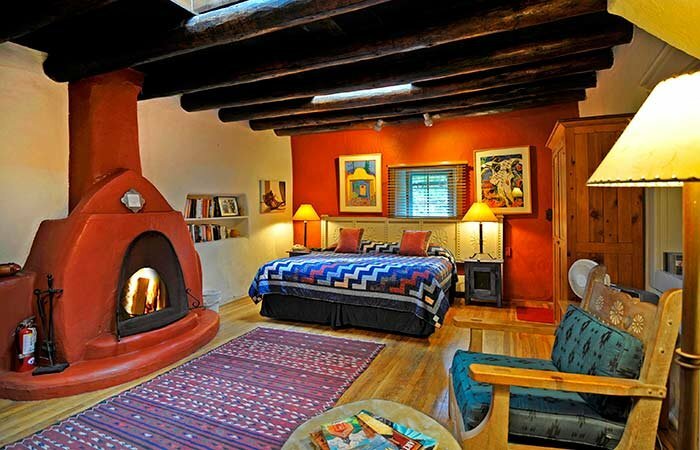 This charming room with a hand crafted Santa Fe queen-sized bed, two wing-back chairs and large corner gas log fireplace features the works of renowned Taos Pueblo artists. 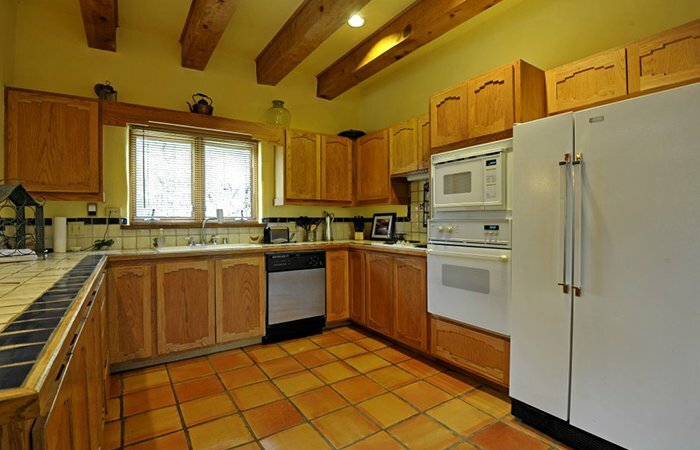 Views of graceful willows, towering cottonwoods and a beautiful courtyard from your French doors. 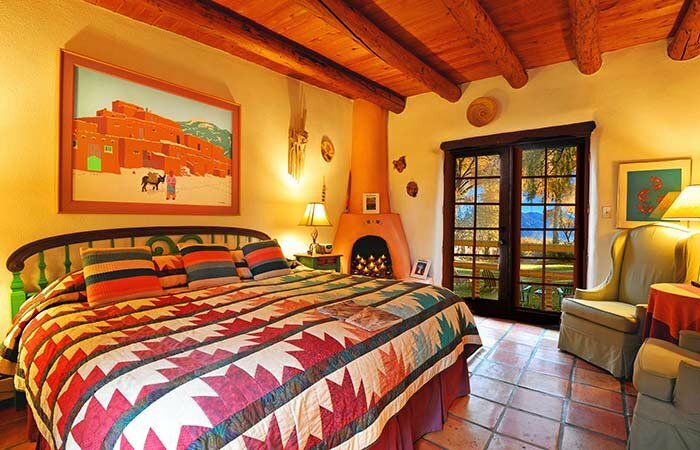 Located in the same adobe casita as El Pueblo and Rio Grande, this room with soft Southwestern colors has a king-sized bed, corner candlelit fireplace, and French doors that open out to a wide expanse of lawn and gardens with a grand view of sacred Taos Mountain. Tub-shower combo. 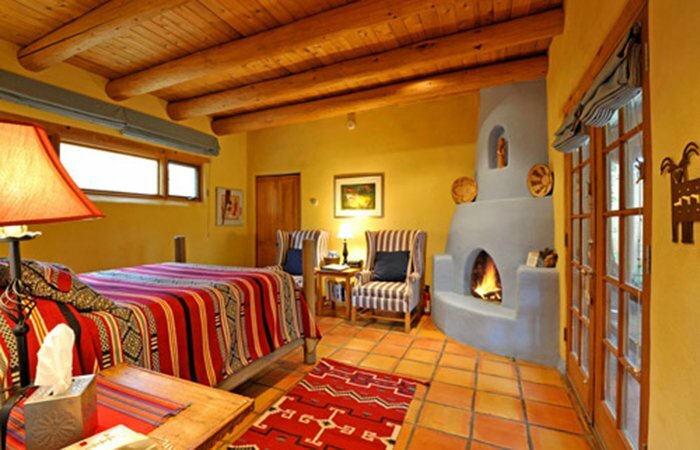 The Los Amantes Room was built in the 1920s as a writing room for Mabel Dodge Luhan. 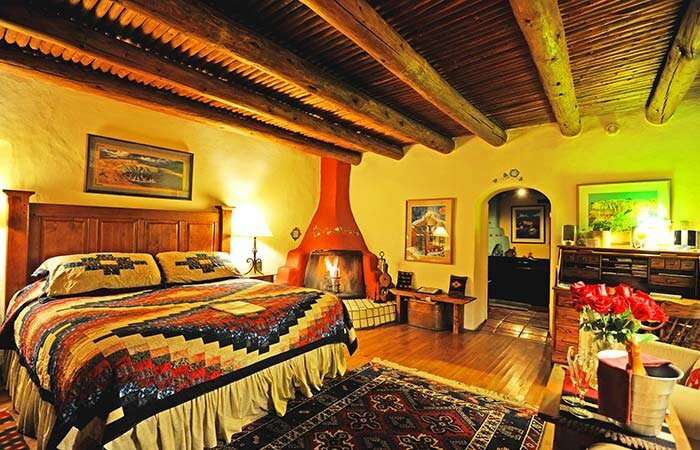 The bedroom has a king-sized bed with a handmade quilt, an antique roll-top desk and two over-sized comfortable chairs for gazing at the wood-burning kiva fireplace. 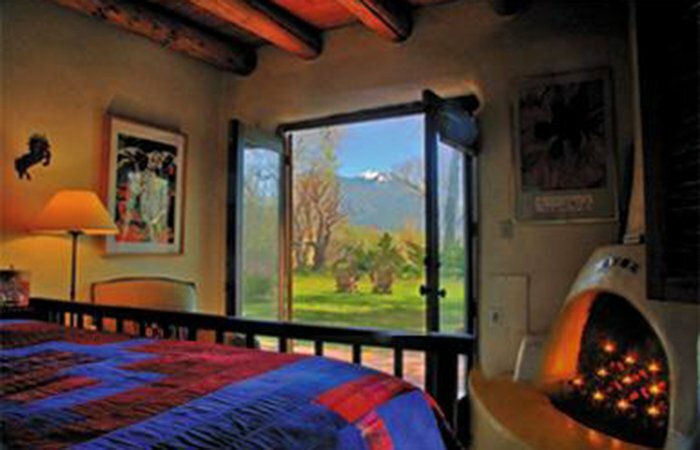 Large windows looking out on Taos Mountain and the gardens make for a special stay. 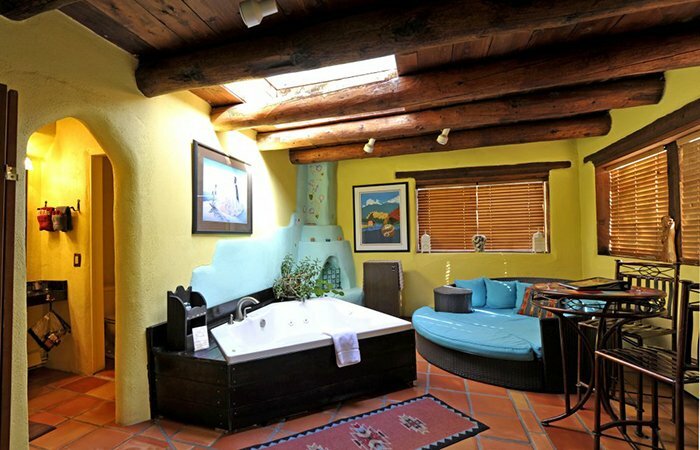 The brand new double Jacuzzi tub has its own room with a rattan daybed, skylight, and bistro table and chairs. 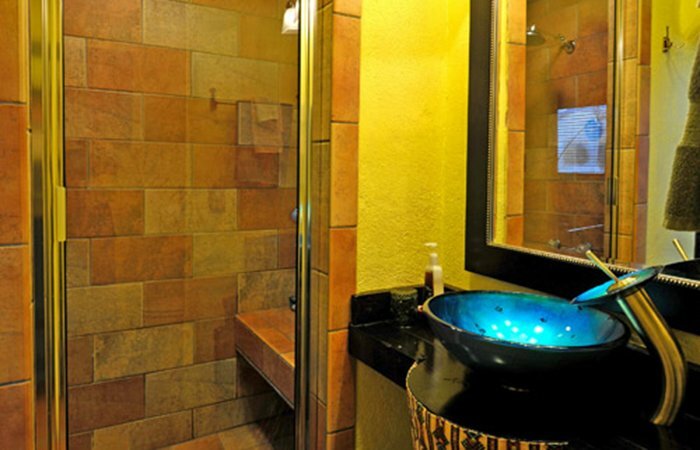 The adjoining bath, with stone-tiled rainforest steam-room shower, has a glass vessel waterfall sink. 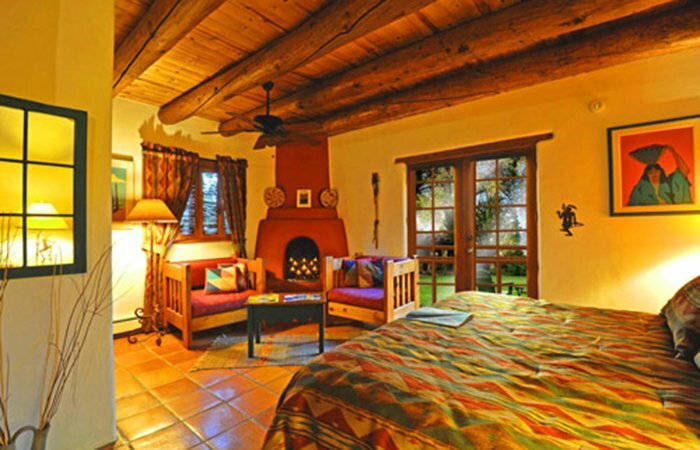 A charming, historic room for special occasions and getaways. Mini-fridge. 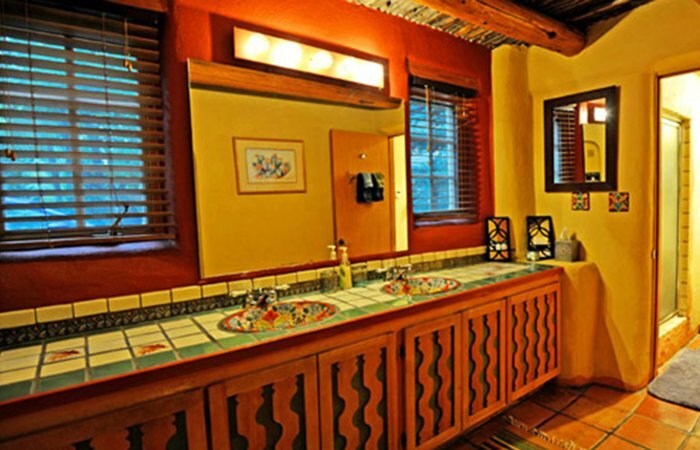 Mabel Dodge Luhan owned and entertained her guests in Mabel's Salon. 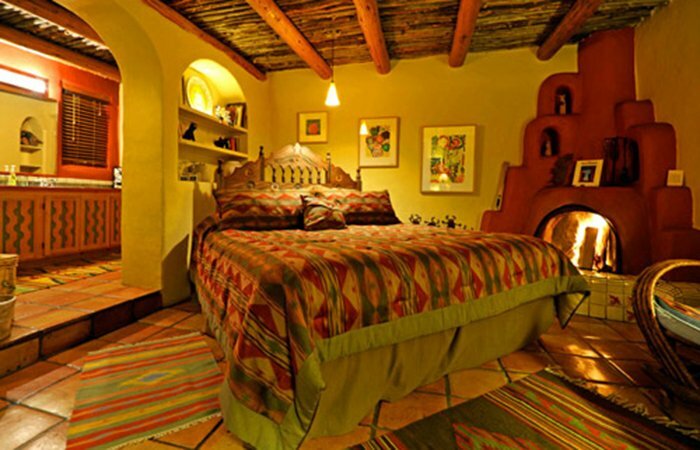 A large historic room with thick adobe walls, a king-sized bed, Mexican-tiled bath and shower, mini fridge, and a wonderful wood-burning kiva fireplace. 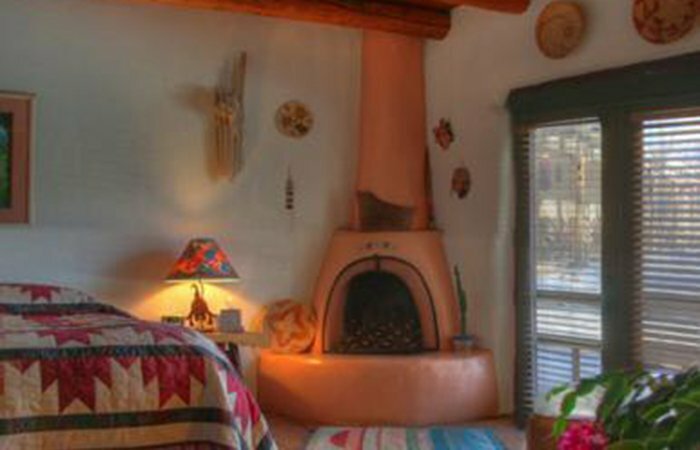 Mabel's is a step back into Taos' history with its beautifully handcrafted Taos style furniture. 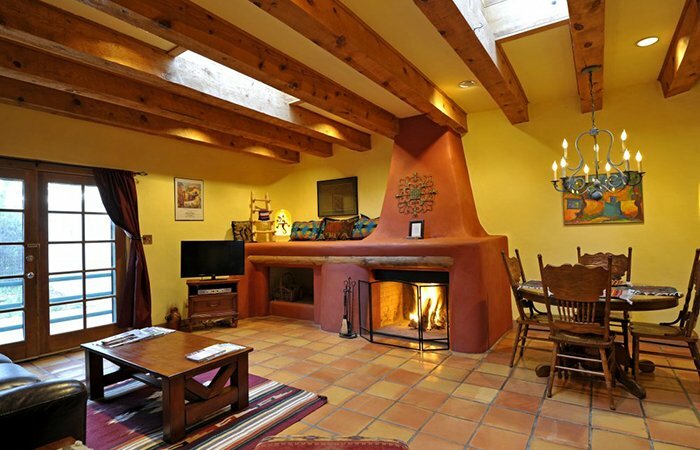 Also in the casita along side El Pueblo and La Vista, this spacious room boasts a beautifully tiled bath, writing desk, king-sized bed, and comfortable Taos chairs in front of a large corner gas kiva fireplace. 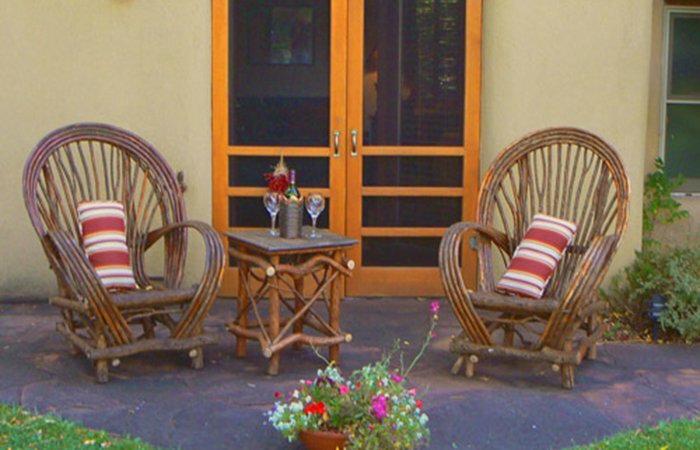 Magnificent garden view from the French doors with two Adirondack chairs awaiting you and a glass of wine. 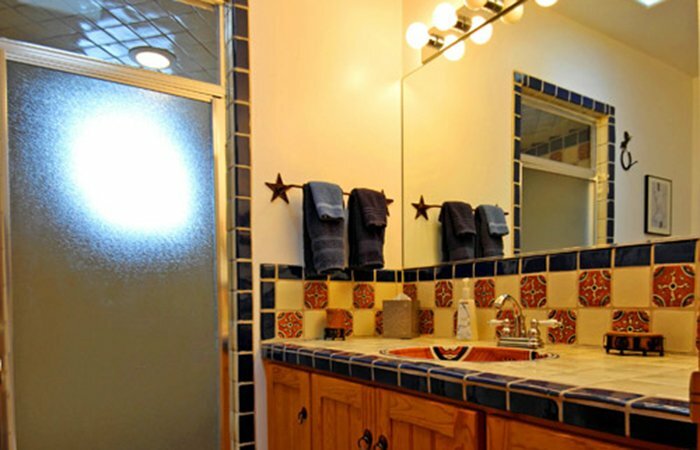 Skylights and floor-to-ceiling windows make this a cheerful southwest room with a spacious mexican tiled bath and shower. The patio door opens on to a beautiful courtyard. 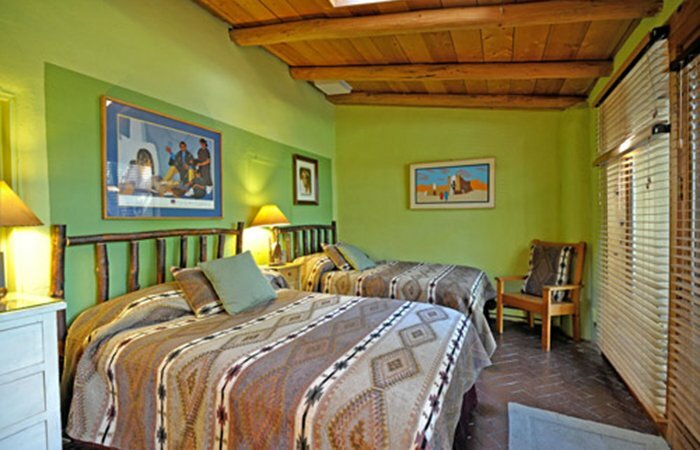 This room is furnished with two handcrafted double beds and comfortable rocking chairs. 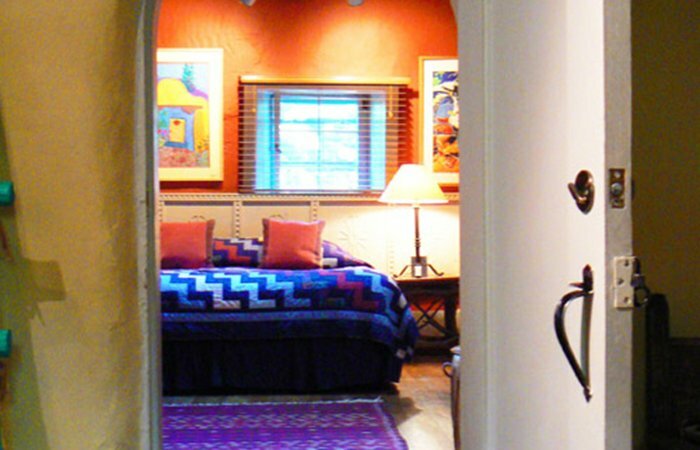 Located in the historic section of the hacienda, the front door opens to the art gallery and living room. 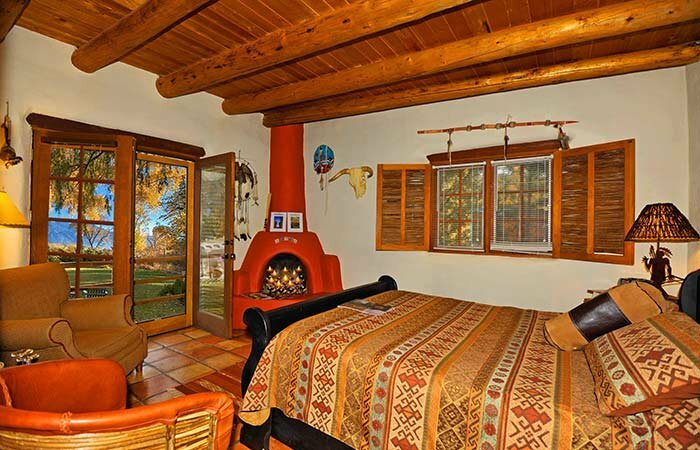 Just redecorated, the main room of this two-room suite has a beautiful queen size bed and leather sofa in front of a corner gas log kiva fireplace. 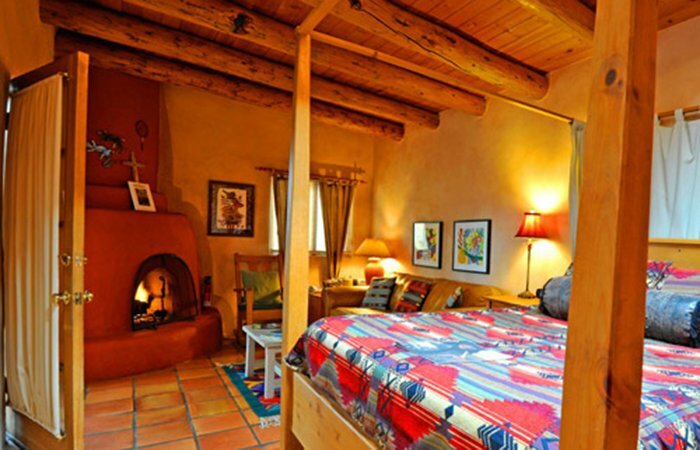 The smaller room has two cozy, southwest twin beds. 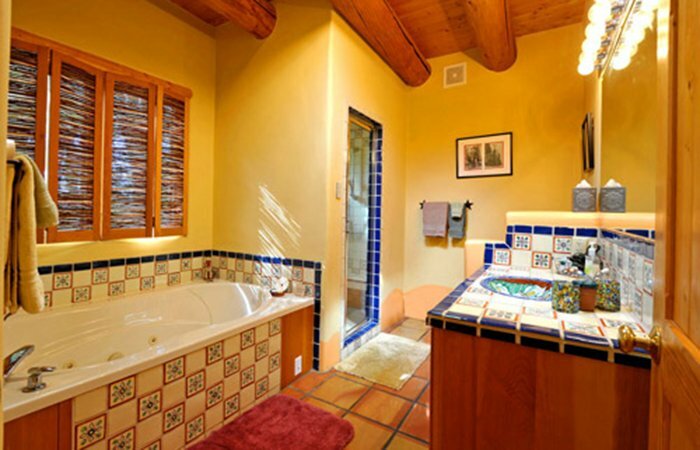 The spacious mexican tiled bath features a separate shower and wonderful two person Jacuzzi tub with a skylight above. Spectacular 2 bed, 2 bath private Taos guest house, off-site, available to book through the Hacienda del Sol, call for details 575-758-0287 or go to www.vrbo.com and view our listing 554722. 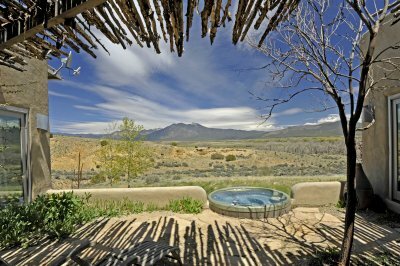 Deposits are refundable with a 14 day notice, less a $25 per room cancellation fee. If a cancellation is made within14 days of your arrival, your deposit is non-refundable, and you are responsible for the remainder of your stay unless we can rebook your room. There are no refunds for late arrivals or early departures. Please understand that due to the small and intimate nature of our business, we must adhere strictly to this policy. Please note during the Christmas and New Year Holiday times, we have 30 day cancellation policy. Check in time is between 3pm to 6pm. If you are planning to arrive early please call us to see if an early check-in is possible. If you arrive after 6pm, we have a very simple self check-in procedure. When you enter our driveway, look for the parking sign for your room. Attached to the sign is a mailbox where your keys and instructions will be awaiting you. Checkout is 11am. Pet Policy: We do have a few rooms that are dog friendly, please contact us for more information on our doggie rules and fees. Sorry, we do not allow cats or other furry friends. Just a reminder, there is no smoking inside any of the buildings - only outside on the grounds. Looking for that perfect gift? 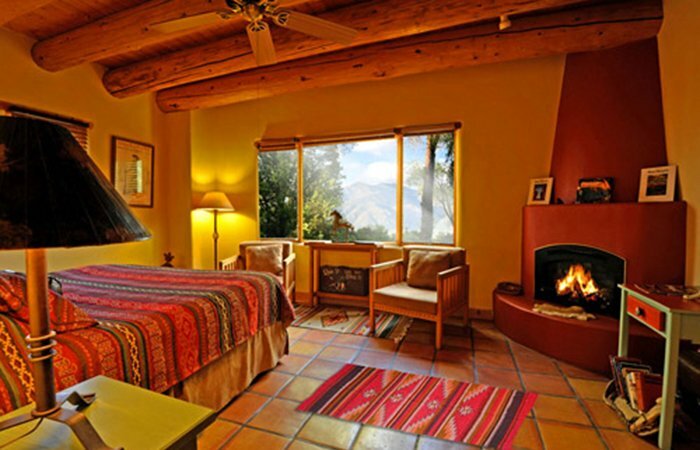 Give your loved ones a Hacienda del Sol Gift Certificate! CLICK HERE to purchase your Gift Certificate!